WHY HIM? is hilarious and brutally blunt. One of the most entertaining R-rated comedies I’ve seen in recent years. You have got to see James Franco in this film, his character’s got tons of unexpected F-bombs and he plays it like a teenage kid in a candy store. Written by Ian Helfer and directed by John Hamburg, Bryan Cranston plays an overprotective but loving dad named Ned whose printing business is on the brink of failing. He brings his family to visit his daughter at Stanford where he meets her well-intentioned but socially awkward internet billionnaire boyfriend, Laird, played by James Franco. Of all the men in the world, Ned wonders why his daughter had to go with this Laird fella. I think what makes WHY HIM? effective is Franco’s unfiltered performance, there’s something so disarming and appealing about a man who’s eccentric and brutally honest. You can tell Franco is just having a blast playing this character because he probably just has to tap into his younger frat self where inhibition goes out the window. And so Franco’s Laird wants to impress his girlfriend’s family so bad to the point of trying too hard and on the other corner of the ring, Ned thinks he knows what’s best for his daughter, Stephanie (Zoey Deutch) but none of them ever asks Stephanie what she wants for her life. This film could’ve easily gone down the route of just full on Ned vs. Laird the entire time much like last year’s “Daddy’s Home” featuring Will Ferrell vs. Mark Wahlberg, but I’m glad that’s not exactly what WHY HIM? is gunning for. The humor stems partly from us finding Laird’s lifestyle completely outrageous and partly because we kinda wish we could experience that lifestyle even for just a few days. There’s also that old school ways vs. high tech ways of doing things but mostly the film is about two men who genuinely love the same girl but are having a hard time looking past themselves. 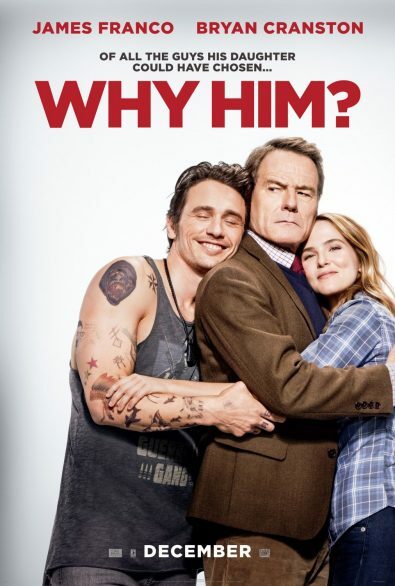 This is definitely not a film for conservatives but I think conservatives would get the most benefit out of watching WHY HIM? Movie Review: #AssassinsCreed Huge Let Down!